Connecting the Probe and Downloading the App. Download the iOX app from the App Store or Google Play. 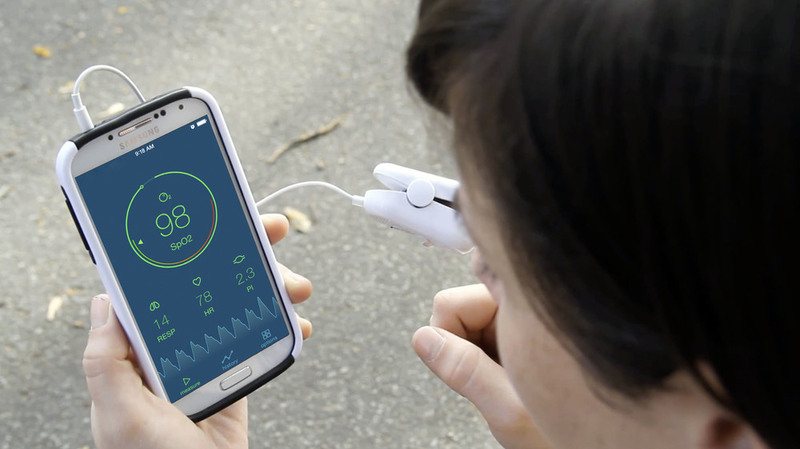 Connect the iOximeter to your device. Insert your finger into the iOximeter. Make sure your finger is positioned properly. View your results on your device. Your Sp02 will always be the main reading shown in the center. To view your respiration, heart rate, or perfusion index as the main reading simply touch the number. The perfusion index is abbreviated to PI and the respiration rate is RESP. To set your alarms, go to the "options" page and click on "Alarm Settings". Once in the "Alarm Settings" you can program or reset your alarms. You will also be able to turn on and off alarms. To view your history, go to the "history" page. Inside the history page you will be able to navigate through your data by choosing a month, day, and time. Once you've selected a time frame of recorded data, you will see it graphed. Sp02 and Heart Rate are displayed together. Press the "PI RESP" tab to view the perfusion index and respiration rate. To export your data, press the export button at the top of the "History Data" page. The app will create a CSV file that you can email to yourself or your doctor. You'll get a nice little email that will have the CSV data attached.